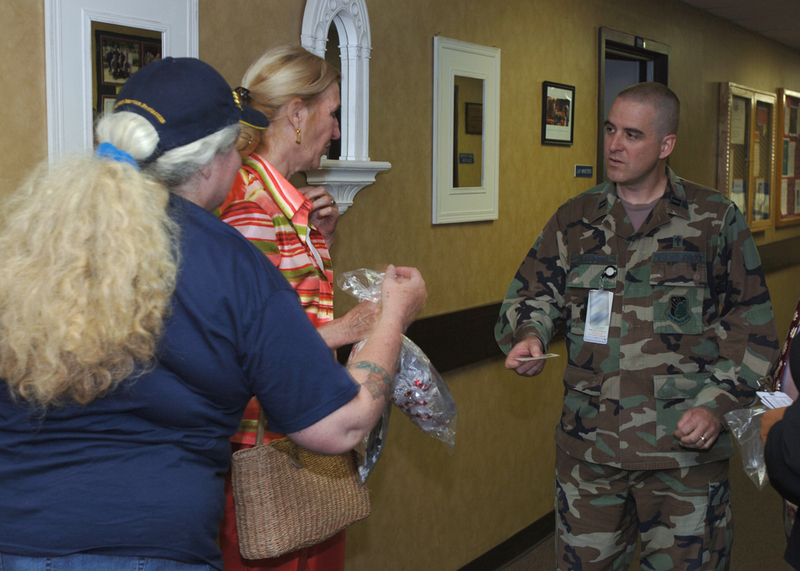 Patricia Gallagher, Team of Angels Project director, presents a supply of angel pins and bookmarks to Chaplain (Capt.) John Elliot at the Wilford Hall Medical Center Chaplain’s Office on June 5. The pins will be distributed to hospital patients and their family members. The inch-high lapel pins feature three gold angels with linked hands and are attached to a bookmark with a short inspirational poem. So far thousands of service members and their families have received angel pins. (U.S. Air Force by Staff Sgt. Ruth Stanley).